Pierre Marie Arthur Morelet (1809-1892) was an ‘amateur’ scientist who devoted himself partly to shell collecting and partly to botany. He organised several expeditions, of which those to Cuba and Central America (1846-1848) and the Azores (1857) are especially noteworthy. His contributions to malacology were thus significant and we have reconstructed his legacy by a survey of archival sources and his type material in historical collections of several museums. The resulting monograph is made up of two parts. In the first part we present a biography, some remarks on the whereabouts of his collection, and more than 200 recovered letters (transcribed and translated) to contemporary malacologists, such as Crosse, Fischer, Baudon and Dautzenberg. His contact network has been reconstructed using data from his correspondence and his publications. This part offers an unique view into the world of malacology in the second half of the 19th century. In the second part a bibliography of Morelet is presented, as well as all his newly introduced taxa, with detailed documentation and figures of the species. More than 80% of his type material has been re-found and original figures, if they exist, have been reproduced for the remaining species. Of the taxa represented by actual shell material, more than 150 are now figured for the first time. 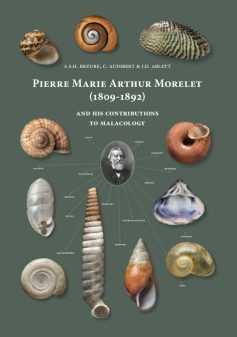 The book has indices for both taxonomy and persons mentioned and is a must-have for anyone interested in the history of malacology and those dealing with non-marine molluscs. The book, which has 544 pages and more than 1300 figures, is available after its launch on 23 June 2018. Thanks to financial support from Association Cernuelle (France), Royal Belgian Institute of Natural Sciences (Belgium), Natural History Museum (United Kingdom), and the Netherlands Malacological Society (Netherlands), the electronic version of the book is freely available here (password: Morelet1). A printing on demand hard cover version of the book can be ordered at www.boekenbestellen.nl (search for title or ISBN) for € 67.50 (net price, excluding postage).